Most of Indians have poha in their breakfast. 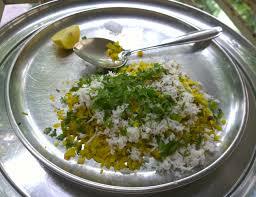 Mostly Maharashtra and MP state people have poha in their breakfast. Poha recipe is so simple to make having simple ingredients. But it tastes so delicious. In our busy morning, it is convenient to make poha for the breakfast. Just somewhat differences have there in everyone's poha recipe. In the same state also different methods are there to make poha recipe. Somewhere simple kanda pohe, somewhere Popat pohe, and somewhere khatte mithe pohe so many different methods are there of poha recipe. Today we are going to make MP Style poha recipe, so let's start it. 1. Cut onion, Green chili, coriander. 2. Wash poha and soak it into the strainer. till all other procedure goes in a proceeding. 3. Put salt in it. 4. Take a pan put it on the flame, pour oil into the pan. 5. When oil gets heated put groundnuts into it. 6. Stir well the groundnuts, when roasted well, take out of the pan put aside. 7. Now put mustard seeds into the pan, when it crackles, put curry leaves in it. 8. Now put green chilies stir it well. 9. After that, put onions into it. Stir it till becomes translucent. 10. Now put roasted groundnuts into it. 11. Now put coriander powder, saunf powder into it and stir it well. 12. Then put turmeric powder and mix it well, so that all the mixture in it take the color of the turmeric. 13. Now put the soaked poha into the pan, mix it well. 14. It turns yellow in color because of turmeric in it. 15. Put the lead on it for 5 minutes to cook poha well. 16. Now take on the lead, take the poha into the serving bowl, and garnish with coriander. 17. Put desiccated coconut on it, And serve it hot with yogurt. Or you can put lemon juice on it.